HÀ NỘI – Shares shook sharply on Tuesday’s afternoon trade under increased profit-taking activity but still closed higher thanks to solid investor confidence in the market outlook. On the HCM Stock Exchange, the VN-Index rallied 1.63 per cent to end Tuesday at 918.30 points after rising as high as 930 points in early afternoon trade. This was the highest score since January 2, 2008. 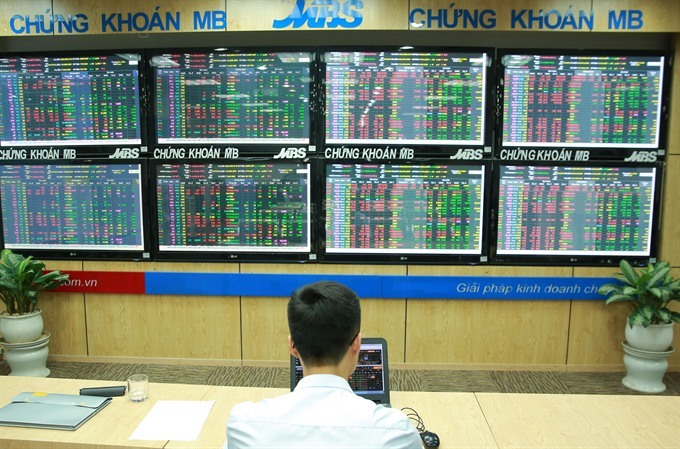 Vietnamese shares have been bullish since the start of the year with the benchmark VN-Index expanding over 38 per cent. Large-cap stocks continued to be the major supporter behind the market’s rally. The top 30 largest shares by market value and liquidity (VN30) gained 1.25 per cent with major advancers including brewer Sabeco (SAB), up 4.4 per cent; Vietcombank (VCB), up 3.8 per cent; Petrolimex (PLX), up 5.4 per cent; and Masan Group (MSN), up 5.6 per cent. VinGroup (VIC) and its retail arm Vincom Retail (VRE) extended their gains. While VRE again hit the daily limit rise of 7 per cent yesterday, VIC slowed down its growth to just 0.9 per cent. Market value of these two companies soared to total US$14 billion yesterday. The biggest listed stock Vinamilk (VNM) also rose over 1 per cent. “The market breadth was negative, however, showing an imbalance in growth,” said Thien Bui, a stock analyst at Viet Dragon Securities Co. Overall, 116 stocks advanced while 151 declined. Another 79 closed flat. According to BIDV Securities Co (BSC), yesterday’s cash was quite strong but focused in large caps as well as potential sectors such as banks and securities. Over 230 million shares worth nearly VNĐ6.5 trillion ($285 million) were traded on the HCM Stock Exchange, up 31 per cent in volume and 14 per cent in value compared to the previous session. “The market is in an uptrend and there is no resistance when the expectation of the index increasing is becoming stronger,” BSC’s analysts wrote in a report yesterday. Foreign investors returned as net buyers on the southern market after net selling on Monday. They picked up shares worth net value of VNĐ43.5 billion. In contrast, shares on the Hà Nội Stock Exchange declined for a second day with the HNX-Index inching down 0.08 per cent at 108.02 points. The northern market index lost 0.2 per cent on Monday.